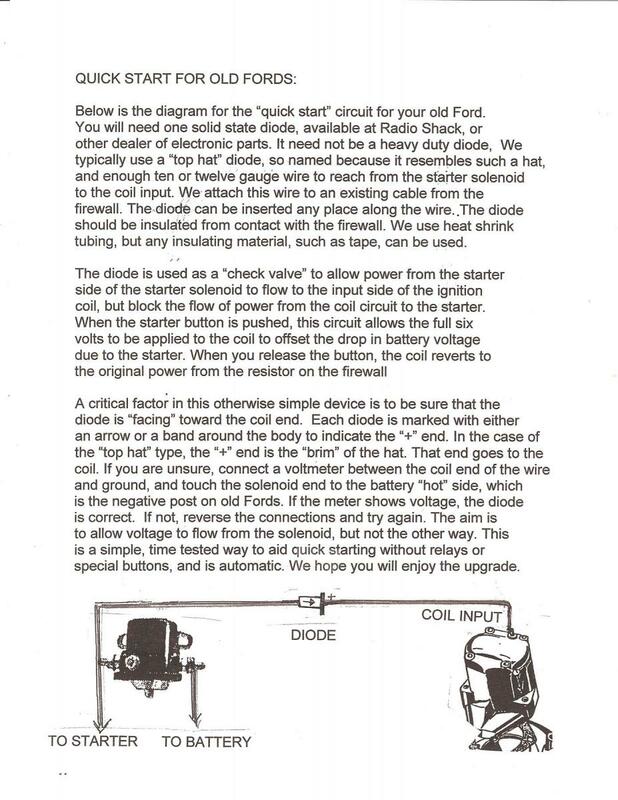 Many years ago or so, Jake sent me a wiring diagram for a hot start, not just temperature but all the time, that he would make for me for $50. It provides full battery voltage on start. Does anyone have. the drawing in detail? Thanks Jim. 57 year owner of a 46 sedan. Here is a write up and diagram of the 'Hot Start" circuit. It was written by Supereal for the Early Ford V-8 Club Forum. IMHO is is just a band-aid to bypass a problem with the car. There are 3 main causes of hot start problems, excessive fuel, lack of fuel and weak spark. Excessive fuel comes from a leaking carburetor flooding the engine. Lack of fuel comes from a weak fuel pump or a vacuum leak in the supply side of the fuel pump. Weak spark can be a bad coil or condenser or worn points.